Reader mail: My condo’s shared Wi-Fi signal is weak. Any ideas? Mary Ellen writes: Is there a device that would pick up and strengthen a weak Wi-Fi signal? I have a condo in a building where Wi-Fi is provided but it is shared by another unit, and the router is not located in my unit. Although my smartphone can receive emails etc., my Roku is constantly buffering. Is there a device I could buy to pull the signal in stronger so I can stream movies and shows on my Roku? Hi Mary Ellen! That’s a tough situation. Normally, I’d suggest saving money by simply moving your Wi-Fi router closer to your Roku. But since we’re dealing with a weak Wi-Fi signal that’s shared, I’m guessing that moving the router closer to your condo isn’t an option (although it doesn’t hurt to ask, right?). As long as your condo’s shared Wi-Fi router isn’t too far away, a wireless extender may do the trick. A Wi-Fi extender piggybacks onto to an existing Wi-Fi access point to create its own local network, which essentially extending the range of the original network. A Wi-Fi extender piggybacks onto to an existing Wi-Fi access point to create its own local network. 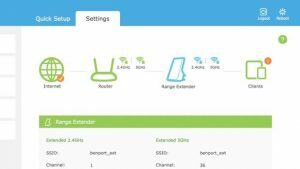 Setting up a Wi-Fi extender is easy. All you need to do is power it up, then use the extender’s configuration utility to choose a nearby Wi-Fi signal to extend. If the router you’re trying to extend is locked, you’ll need its password. You can then give the extender its own SSID (the name the extender uses to identify itself when you’re searching for Wi-Fi signals) and connect your Roku and other devices to the extender rather than your condo’s Wi-Fi router. You could also just keep the same SSID as the shared router, but doing so would make it tough to tell whether your devices are connected to the extender or the (weaker) shared signal. While Wi-Fi extenders are easy to use, they’re not necessarily cheap. The one I use in my Brooklyn apartment goes for about $100, and the cheapest extender recommended by The Wirecutter costs about $65. The other issue is performance. If your condo’s shared Wi-Fi router is too far away or if there’s too many other competing Wi-Fi signals nearby (which I’m guessing is the case, given that you live in a condo), an extender may not be able to connect to the shared router—or, even if it can, the boosted signal might not be strong enough for smooth streaming video. 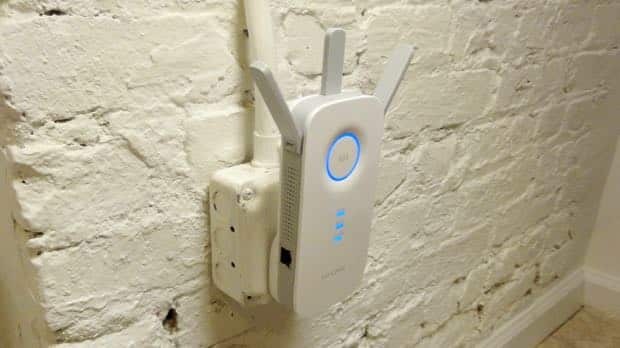 Unfortunately, the only way to find out if a Wi-Fi extender will work in your particular situation is to try one, so you might want to make sure you’re protected by a 30-day return policy before you break out your credit card. Note: If you do decide to go for a Wi-Fi extender, you should do your best to ensure that the extender uses one frequency band to connect to the main Wi-Fi router and another for connecting to other Wi-Fi devices, like your Roku. Most Wi-Fi extenders these days are dual-band, giving you the choice or either the speedy but short-range 5 Ghz band, or the longer-range but slower 2.4 Ghz band. If your extender uses the same frequency band for connecting both to your condo’s shared Wi-Fi and connecting to your Roku, you’ll degrade wireless performance for everyone on the network, not just you. If all that sounds complicated, well, it is; luckily, Wirecutter has tips (scroll down to the paragraph that begins “The main problem with…”) on the best way to configure your extender. If your shared Wi-Fi router is too far away for a Wi-Fi extender to work, you could try another option: a direct wired connection. 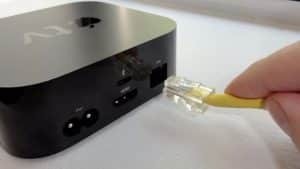 You can always just connect your Roku (or Apple TV, pictured here) to a router directly via Ethernet. Simply put, you could connect an Ethernet cable to one of the Ethernet ports on the shared Wi-Fi router and then string the cable all the way to your condo. You could then connect the cable directly to your Roku—or, even better, connect it to your own Wi-Fi router, thus creating your own local Wi-Fi network. The downside, of course, is convincing your building manager to let you string Ethernet cable from the shared Wi-Fi router to your unit, plus the hassle of actually running the cable. If dealing with all that Ethernet cable sounds daunting, here’s an idea that might sound more tempting: using the existing electrical wiring in your building to extend your condo’s Wi-Fi signal. 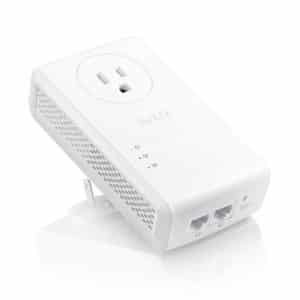 A “powerline” networking kit generally comes with a pair of small adapters, each with their own Ethernet ports. You connect one adapter to the main Wi-Fi router via an Ethernet cable (a short cable this time), then plug the adapter itself into a nearby power outlet. Next, you take the second adapter, plug it into another power outlet in a different room (or a different unit, in this case), connect it via Ethernet to your Roku, another Wi-Fi router or any Ethernet-enabled device, and voilà—you’re connected. Powerline networking kits are generally a bit cheaper than Wi-Fi extenders (Wirecutter’s top pick is only about $85), and since you only need to plug them into exiting power outlets, there’s no need to string Ethernet cable. Again, though, you’ll need to check with your building manager to see if they’ll let you connect a powerline adapter to the condo’s shared Wi-Fi router. Also, as with Wi-Fi extenders, powerline data performance will suffer the further the two adapters are from each other. Other factors that might slow a powerline network’s performance to a crawl include whether the powerline network would need to jump from one electrical circuit to another (probably yes, since the condo’s shared Wi-Fi router isn’t located in your unit), as well as how many other electrical appliances are plugged into those circuits (a lot, I’m guessing). OK, so let’s say the Wi-Fi extender didn’t work, powerline isn’t an option, and you struck out with the super when you asked about Ethernet. Now what? 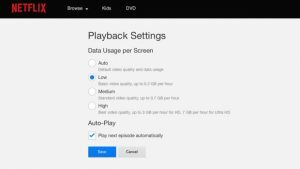 Change your Netflix bandwidth settings could help smooth out video playback over a weak Wi-Fi signal. Well, if you use your Roku to watch Netflix videos, there’s another option: lower the amount of bandwidth Netflix needs for streaming. Doing so might let you stream Netflix movies and TV shows over a weak Wi-Fi signal without buffering, although you’ll sacrifice video quality—potentially a lot of video quality—in the process. Just log in to your Netflix account on a desktop Web browser, hover your mouse over your profile name in the top-right corner of the page, click Your Account in the menu that appears, then click “Playback settings” under the My Profile heading. Next, pick a setting. Try “Medium” first to see if that plays smoothly; if not, downshift to “Low.” (These playback settings will transfer over to the Netflix app on Roku, by the way.) You might have to settle for VHS-level video quality, but at least the picture won’t freeze every few seconds. So, what about tethering your Roku to your hotspot-enabled Android or iOS device—would that work? Perhaps, but unless you’re fine with massive overage charges on your wireless bill, I’d advise against it. Why? Because streaming video over a cellular data connection could easily blow through your monthly mobile data allowance in a matter of hours, particularly if you’re watching HD-quality video. Even if you’re lucking enough to have an unlimited 4G data plan, your unlimited data usually doesn’t extend to using your phone as a hotspot. Hope this helps, Mary Ellen, and good luck! Anyone else have suggestions with how to deal with weak wi-fi signals in shared spaces? If so, post ’em below in the comments. Reader mail: Is Apple TV worth it?